Today I get to tell you about something totally cool! This is Hoooked Zpagetti (not a spelling mistake!). This stuff is made from ……. T-shirts! How cool is that! And if you’re wondering what on earth can you knit or crochet with it, just take a look at this for inspiration! 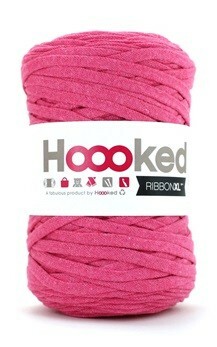 This is Hoooked Ribbon, made from ………….. recycled yarn!! Super duper cool! If you love recycling as much as me, and also enjoy crochet and knitting, then check out all the wonderful Hoooked Yarns over at Fabric Yard! And to tempt you even further, Fabric Yard are having a Spring Sale! You’ve got until 1st March to bag yourself a bargain! And remember, only £1 shipping on all UK orders. Next Next post: Photo Fun!